During the colonial, Republic and statehood days of Texas, it was not unusual for a man to combine the duties of Texas Ranger and Surveyor. Early surveyors had to be able to defend themselves while measuring the land, and it was logical to combine the two skills into one. Beginning with Stephen F. Austin, surveyors were required to use the vara as the standard unit of length and mark every corner of a survey. Every property line was marked, and careful notes and plats were made for each survey. While a typical survey party consisted of a surveyor, two chain carriers, trail blazers a cook and a guide, many parties were accompanied by armed guards. After Texas was annexed into the United States in 1845, it retained control over its public lands. The Texas Rangers were organized into two groups following Civil War Reconstruction. The Frontier Battalion (1874-1901) operated state-wide, and the Special Forces (1874-1881) were stationed between the Rio Grande and Nueces Rivers. Under the command of the Texas Adjutant General, Rangers were charged with protecting Texas from Indian and bandit raids. Beginning in the 1880s, each Ranger carried a Warrant of Authority and Descriptive List. These documents provided proof of the Ranger’s authority and a physical description. 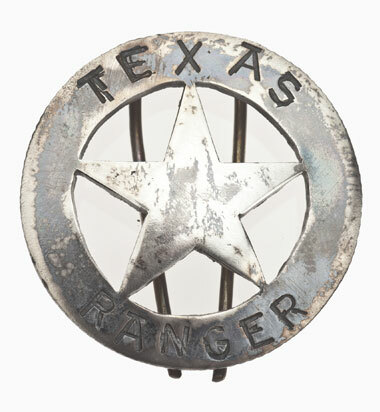 Ranger badges first appear during the Frontier Battalion Era, when their focus shifted from frontier defense to keeping order in the new settlements. John Coffee “Jack” Hays was born in Wilson County, Tennessee in 1817. An adventurous young man, he heard of the stand at the Alamo and decided to move to Texas. Through his service with the Rangers, he became acquainted with Lipan Apache Chief Flacco, who instructed Hays on Apache and Comanche battle strategy. He gained experience as a Comanche fighter, soldier and surveyor. During the course of his Ranger service, Hays participated in the Battles of Plum Creek and Walker’s Creek, among other numerous fights and skirmishes. Along with the introduction of the Colt revolver, his knowledge of Comanche war tactics helped survey parties defend against attack. On April 10, 1874, the Texas State Legislature created the Frontier Battalion to protect the frontier and suppress crime in settled areas. The Texas Rangers of the Frontier Battalion were organized into six companies of 25 to 75 men who were commanded by a Captain and two Lieutenants. The Governor appointed one Major to oversee the entire battalion. By the end of 1881, the Rangers’ primary job would change from frontier defense to more traditional law enforcement duties. Instead of protecting settlers from raids, they stopped feuds, tracked cattle rustlers, horse thieves and bank robbers. In 1900, a court reinterpreted the Ranger Law of 1874 and found that only commissioned officers had full police powers, including the authority to make arrests. As a result, the force was reorganized in 1901.